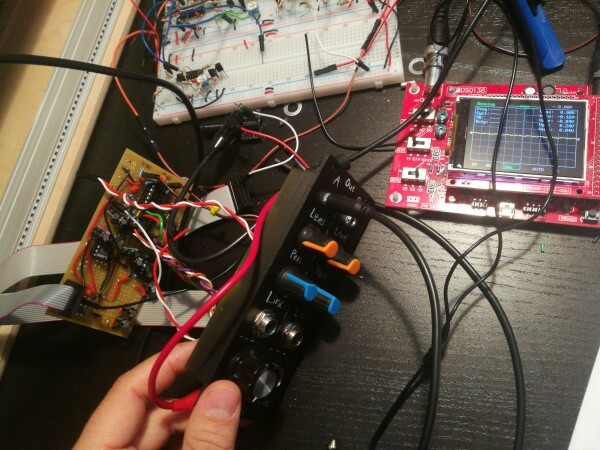 I'm just starting out building my diy eurorack thingie. Second module I'm building is a simplified version of Ray Wilson's panning mixer. I've just taken two channels and stripped the entire FX bus. That leaves me with just 4 TL07 opamps and two 386n-4's so I figured I would just use a TL074CN as opposed to using 4 TL071's as schematic says. So first question, is this a bad idea in any way? Leakage? 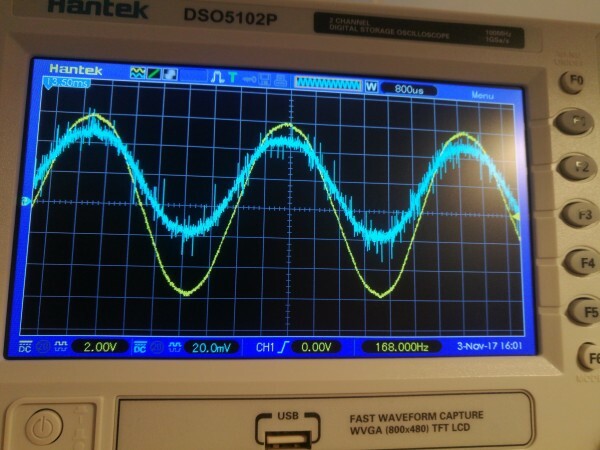 I've checked everything I can think of offline with a digital meter and I'm currently debugging with a cheap scope hooked up, but I'm really out of ideas what to check for. …while writing this, I was gonna do list of my observations and doing that I found that there's most likely just something wrong with the pan pots and I had turned the panel wiring for the main phones level the wrong way. Ok, having fixed the phones level I now just have to fix the pan's. I guess I have a little bit of distortion due to that, signal's being too strong since the grounding via pan wiper is gone, but my biggest concern is a white noise bright hizzing I have in the phones that is entirely unrelated to the turn of any pots, both input gain and also master headphone level. I would think that this is coming from the LM386's and since the main volume pot is actually only doing something with the input signal to these power amplifiers this is probably something I'll have to live with? If I want true quietness on volume 0, then I'd have to have the pot attenuate after the last power amp too, right? for filtering and I don't think you would need to use the gain pins for it, but I'd have to check the internal structure of the chip. boost a signal for processing that isn't audible. At this point I fell I'm stuck with this choice though since I don't think there are any pin compatible and I just want to finish this one quickly. 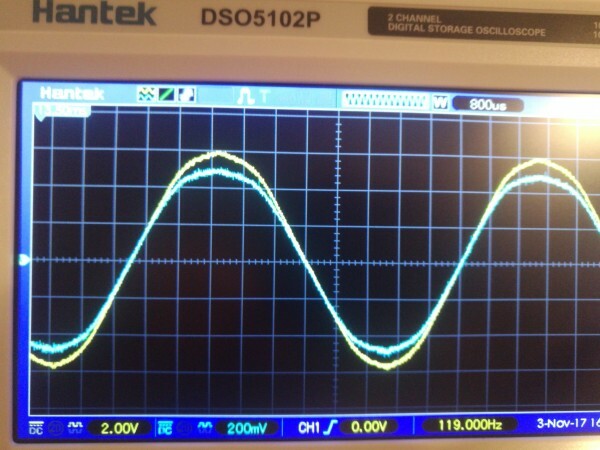 However, the hum was just something I got when doing that feedback to the gain pins. I think I'll leave that idea aside. I don't really understand why this works only when using the gain pins because for me it gets really hummy. You might not need the larger caps but I know the LM386 can sometimes be a bit picky about decoupling. You're not really driving it very hard for headphones though (unless you want to go deaf) but it doesn't hurt to try. Although it is not a poweramp, the NE5532 works really well. Another option is the headphone driver in the Yusynth Output Module -- works very well. Mind the 1/2W resistors, though, where indicated. 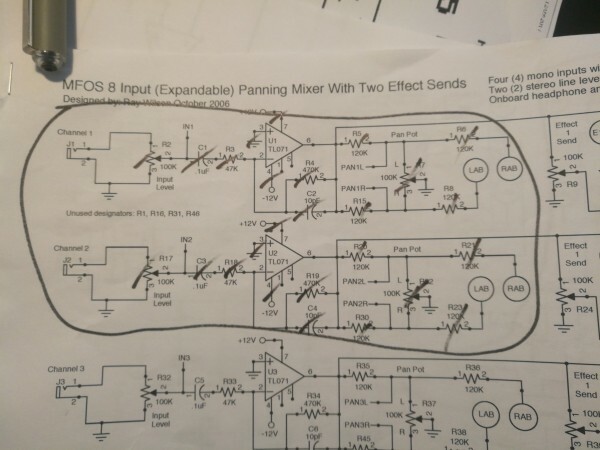 1.1) If no connection between 1 and 8 and connecting the feedback cap+resistor to pin 8 I get a maxed out beep, maybe 5000Hz that almost killed my ears a few times. 1.2) Connecting to pin 1 I instead get a hum that is more pronounced than the original hizz. 2) No decoupling caps seem to make any difference at all for this hiss - it doesn't seem to be related to power flucts. Again though, that gives me a humming that is simply worse than original hizz. I think I'm out of options. I have only one batch of lm386-n4's that I bought from aliexpress and I'm thinking maybe they're a bit defective or something. I have tried a few. I have a few standar lm386 (lower voltage ones) on the way and I'll try those to compare but for now I'll have to live with the hizz. Just an update. I got a a couple of breakoutboards with LM386's in the mail the other day so wanted to compare the noise levels. I got the same noise from just powering up and connecting my earphones. Tried different PSU's too. So I've reached the conclusion (that you guys already told me ) that LM386 simply isn't a good fit for an earphone amp (at least not at these supply voltages). In loving memory, I trusted you Ray! Seems to me that one really would need to attenuate the output of these amps too if one is to use them like this. The hiss isn't related to the input levels, but a constant even if input is grounded. 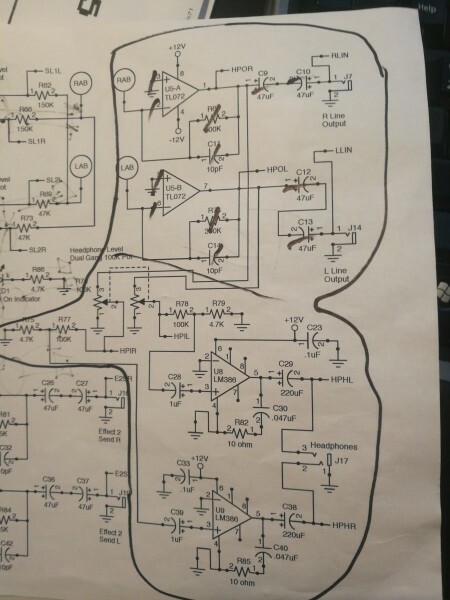 I've breadboarded up your NE5532 schematic and it's dead quiet with grounded input! Yey! A different league than the LM386 one. However, it dists pretty shortly if I turn up the inputs. I'm not sure about the levels it expects and what to look for here. My intention is to actually replace the headphone amp of the MFOS mixer I already built. It has a line output part which is then also fed into the headphone circuit. 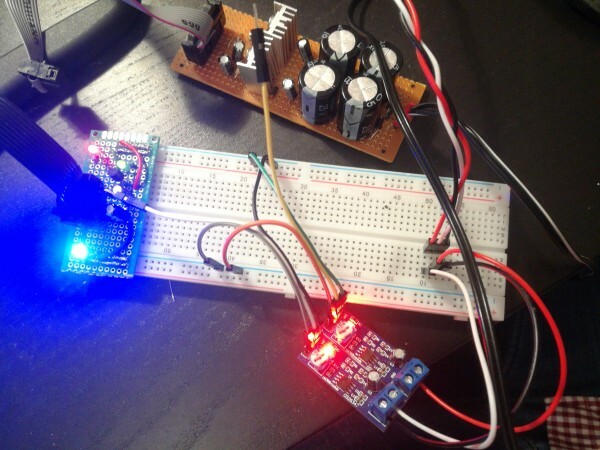 Currently I'm just breadboarding and use a signal straight from an 12V oscillator and attenuate it down on the breadboard. 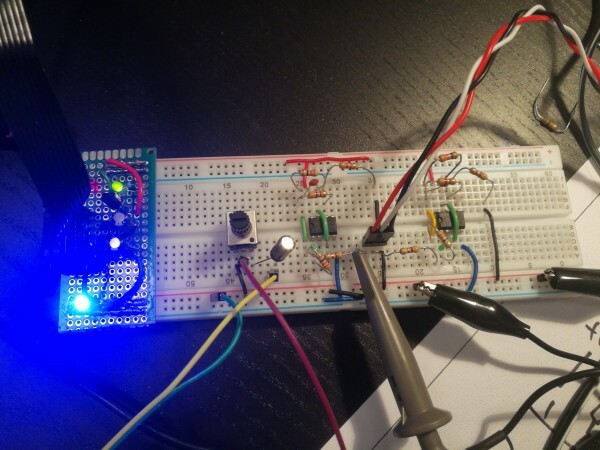 So it seems to start disting when input on pin5 exceeds 1.5V PP. It's still not very loud in the headphones though…? Cheap in-ear plugs. Is this to be expected? I was wondering about the values near the output, 22 and 4.7 ohms seems very little? Got the scope running and it's not actually clipping it's just very noisy. Yellow is input and blue output. The blue is the output straight to the earphones, it looks good even with the earphones connected but it sounds really bad. Tried this earphone output with my old Beyer Dynamic DT-100 which is at 400 ohm. Sounds waaay better and the noise is hardly audible. I would just want to state the to some probably obvious. The LM358 is waaay to noisy for low impedance earphones, but on this one it seems like a perfect match. I have tried to use these earphones in more traditional equipment before and they sound really bad there. I guess they need a lot of power and therefore also cover up a lot of weak noise.